The Estate Agency Marketing Scorecard benchmarks your companies marketing strategy and internal processes and identifies opportunities for improvement and growth with actionable information. "This report give you the blueprint for the next generation of marketing. Read it or the company that replaces you will." "Great report that has helped me identify exactly where we are weak and what to do about it. You’ll read this. Then hope your competition isn’t reading this. It’s that good." "A detailed 22 page report from a company that everyone in Estate Agency is talking about. Fantastic info"
Come to the most talked about event in the industry, find out what the future of estate agency will become and how to adapt your agency to not just survive, but thrive. 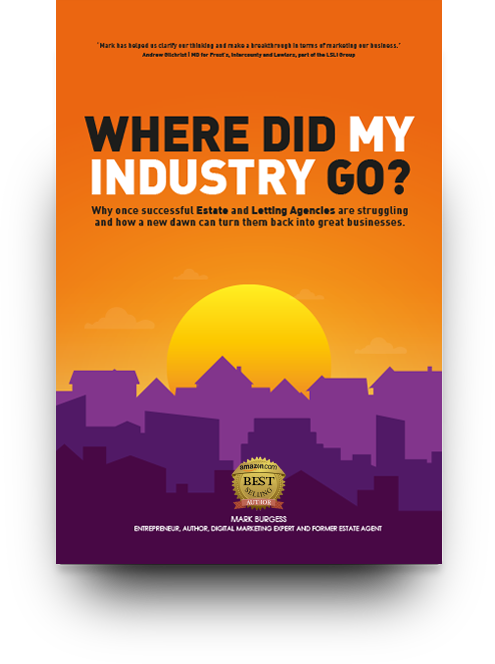 Spend a day with Mark Burgess, the best selling author of ‘Where Did My Industry go?’ Learn how to find your perfect customers and delight them EVERYTIME. This ebook will guide you through all the necessary steps for successfully publishing your ebook. From writing tips to how to better understand your audience. Read through our latest collection of sales strategies for small and medium sized businesses. The ebook is perfect for young business owners and managers. We've compiled an awesome collection of online and traditional marketing tips & tricks. Success is guaranteed if you can implement our recommendations.